For this photo, I’m standing near Paul Revere’s house. 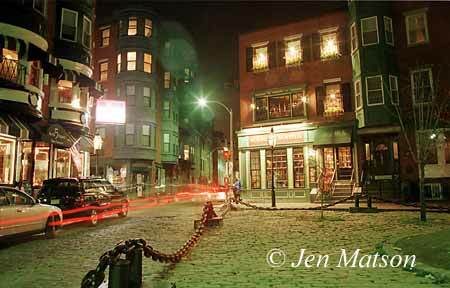 If you are familiar with the North End of Boston, you will recognize this restaurant! Notice the red lights from the car that passed, but there was not enough light for the car itself to register on the film. Most of the people didn’t show up– only the valet, who was leaning against the building for the entire exposure.